The demand for home furnishing and soft goods has increased in past few years at rapid pace, driven by growth in the landscaping market in the United States. Consumers' purchase decisions for home furnishing products furniture are largely influenced by their changing lifestyles and the equal emphasis on both interior and exterior decor. Home ownership is another important factor contributing to rising demand for home furnishing goods as employment levels rebound. In coming years, leading market players in the United States home furnishing and soft goods market are likely to concentrate their efforts on product innovation and eco-friendly business practices, goods and packaging. Moreover, rising construction activities and demand for home furnishing goods will continue to rise as the housing sector recovers. Goldstein Research analyst forecast the United States home furnishing and soft goods market to expand at a CAGR of 6.4% during the forecast period 2016-2024. Further, the market is anticipated to reach USD 79.4 billion by the end of forecast period. The report covers the present ground scenario and the future growth prospects of the home furnishing and soft goods market for 2016-2024 along with the total revenue of home furnishing and soft goods in every region. We calculated the market size and revenue share on the basis of revenue generated per segment, region and state level. The revenue forecast is given on the basis of number of major players and current growth rate of the market. On the basis of distribution channels, offline distribution channels dominated the United States home furnishing and soft goods market with more than 60% share in 2016. Further, growth in online sales of furniture accounted for around 38% of the total U.S furnishing goods sales which is likely to expand at a CAGR of +11% over the forecast period i.e. 2016-2024. United States Home furnishing and soft goods Market Outlook 2016-2024, has been prepared based on an in-depth market analysis from industry experts. The report covers the competitive landscape and current position of major players in the United States home furnishing and soft goods market. The report also includes porter’s five force model, SWOT analysis, company profiling, business strategies of market players and their business models. United States home furnishing and soft goods market report also recognizes value chain analysis to understand the cost differentiation to provide competitive advantage to the existing and new entry players. 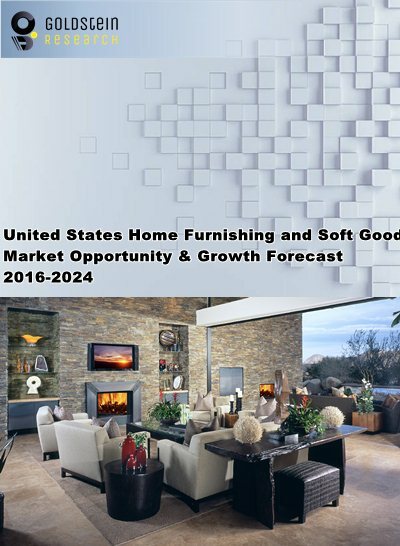 Our United States home furnishing and soft goods market report comprises of the following companies as the key players in the United States home furnishing and soft goods market: Ashley Furniture, IKEA, Berkshire Hathaway Furniture, Rooms to Go, Williams-Sonoma, Bed Bath & Beyond, Macy’s, Home Depot Inc., Kimball International, Inditex, Ahold, Aldi and Herman Miller. According to the report, major driver in United States home furnishing and soft goods market is expanding product lines and innovation in design and materials. With changing lifestyles of the population in the country, the emphasis on outdoor décor has increased considerably in the US. This factor, coupled with the emerging concept of staycation, is encouraging the sales of and demand for outdoor landscaping, including furniture. To meet the growing demand, manufacturers are expanding their product lines by introducing new patio or garden furniture, ottomans, and chaises through new ranges and collections. For example, Bunny Williams Outdoor was launched by Century Furniture in 2016, which is a series of outdoor arm chairs and upholstery lines. Further, the report states that one challenge in United States home furnishing and soft goods market is longer replacement cycle of products leading to decreasing average annual furniture expenditure in the US. Most branded outdoor furniture and furnishing products are durable and of superior quality. Consumers only need to incur maintenance and cleaning costs for these over the years, which are usually minimal. This reduces the need for frequent purchase of outdoor furniture and furnishings, which acts as a major growth barrier for the market.